Inishowen Tourism has been putting its best face forward to encourage potential tour operators to Visit Inishowen and discover the road less travelled in terms of packages for their clients visiting Ireland. The travel trade fair Meitheal took place in the RDS, Dublin, on Tuesday and Wednesday, 14th and 15th of April, and Inishowen Tourism took the opportunity of showcasing their product offering in Inishowen on the second day. The travel trade event hosted approximately 280 of the world’s top travel and tourism buyers from 16 overseas markets from around the world, to engage face to face with 500 Irish tourism businesses. Inishowen Tourism set the scene to promote the peninsula as an action-packed vacation destination to “must see and explore” that offers, splendid beaches, beautiful landscape, combined with culture, tradition, and steeped in historical content at every corner. Seated in the “Wild Atlantic Way” section in the large hall, over 25 meetings with a range of tour operators from the USA, UK, Scotland, France, Germany, Netherlands, and Italy took place. The areas of particular interest to the tour operators were highlighted to meet the needs of their client with a visual presentation and literature in their language of origin. The tours were individually tailored for independent travellers or group travel, capturing the variety of “things to do and see” within the peninsula, and suggestions within the county that could potentially increase dwell time in the Northwest region. Positively to date, the Northwest region has been underdeveloped and unspoilt in terms of tourism activity, however negatively overlooked in terms of group travel or specialist package tours to the county that can make tourism businesses sustainable in the future. 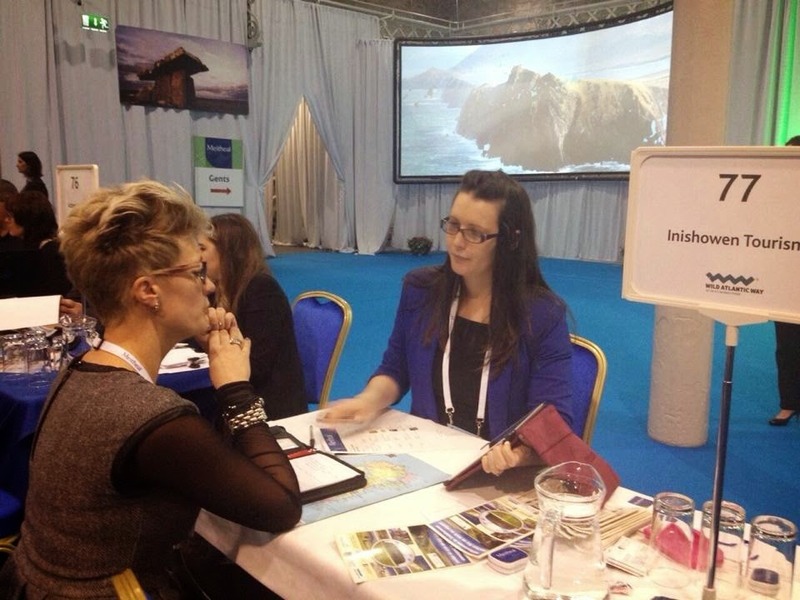 Follow up emails and networking is headed by the manager, Siobhan Kelly at Inishowen Tourism, she stated, Fáilte Ireland organised a series of exciting and compelling tours to highlight all the best Ireland has to offer to a party of influential overseas travel operators who were in Ireland to attend Meitheal, Ireland’s largest travel trade fair. Our aim is to invite them to join us next year when we have our tour operators on board. We have a lot to look forward to, and the team continue to put their best efforts forward to make this happen with a marketing mix set to maximise business for our members in the peninsula. The tours, which take place in the days leading up to the trade fair, are intended to provide the visiting travel agents with a direct experience of what an Irish holiday can offer their customers; a trip along the Wild Atlantic Way, Ireland’s first long distance touring route which is already garnering significant interest overseas. What better place to start than signature point one at Malin Head, as Christine Bleakley recently did on the Brown Mountain Productions documentary of “Wild Ireland” now currently broadcast over the next few weeks on ITV/UTV.